The BLACKLINE features a ready-for-anything cargo system that can be mulit-configured to help get you to lunch, a museum, the ballpark, a street festival, or anywhere the wind blows in the Windy City. The front rack discreetly stores a U-lock and the rear rack features removable waterproof panniers with stow-away shoulder straps so you can tote your gear from place to place. Tough yet refined, this bike has just the right amount of street savvy. 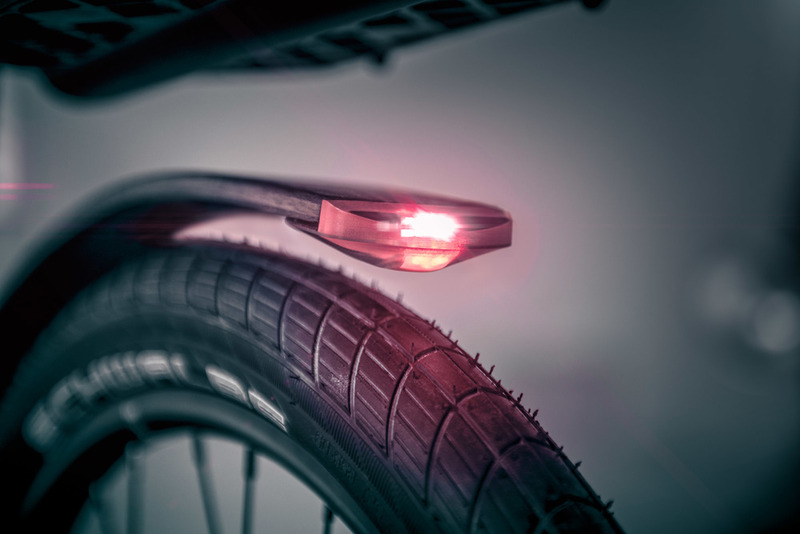 A custom Helios smart handlebar with integrated LED headlight and side blinkers utilize GPS enabled turn-by-turn navigation to help you safely navigate the urban grid. The Helios app helps you get where you need to go safely and in style. With your smart device linked to the Helios handlebars via Bluetooth, turn by turn navigation is as easy as inputting your destination. LED indicators on the ends of the bars blink left or right to indicate an upcoming turn, and signal traffic if your intent at the same time. 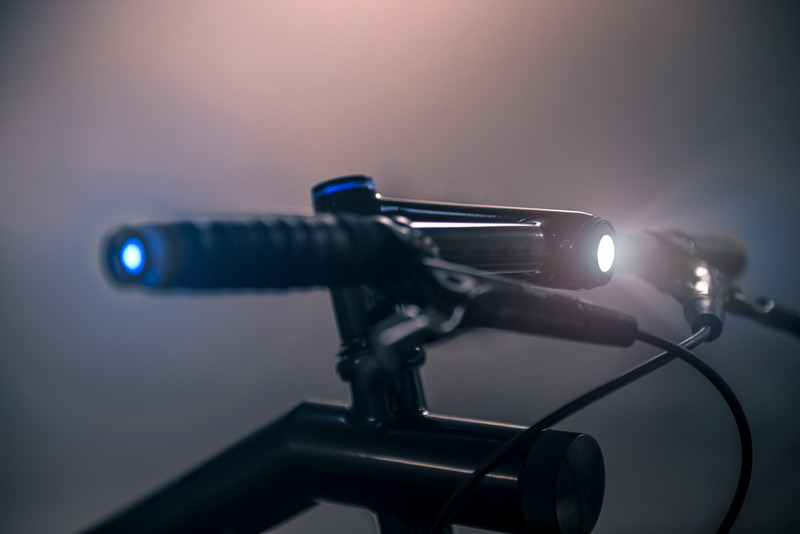 The brightness of the headlamp can be controlled with the tap of a finger, and the ambient riding lights can be configured to any color matches you swag. Want to know how fast you are riding? Set the handlebars to speedometer mode and the LED indicators change color as you ride to give you visual feedback on you speed. And when you lock your bike, the Helios app is there for you. Just send an SMS text to your bike, and you will receive a Google map pin for its exact location so that you are sure your ride is where you left it. 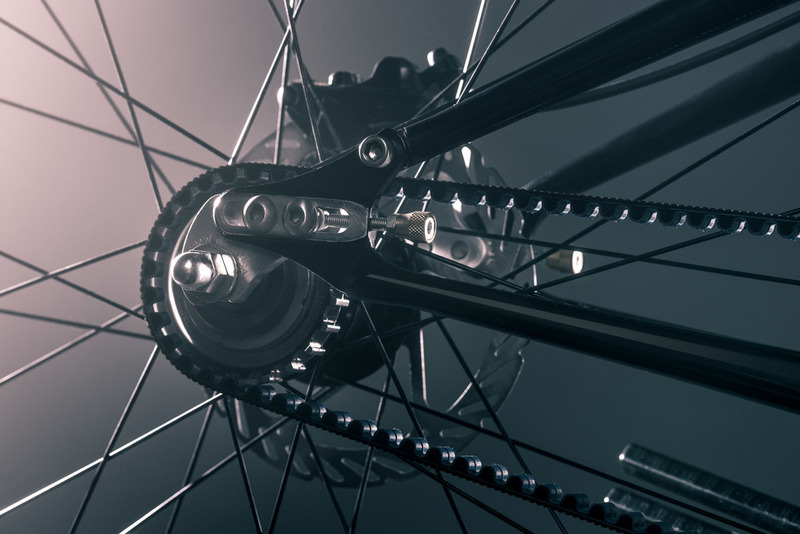 The virtually maintenance-free drive train utilizes a sealed 3-speed SRAM hub, originally designed to endure the extreme conditions of rural Africa. It’s driven by a nearly indestructible belt drive able to withstand everything from the daily commute to the harshest winters. The BLACKLINE features a strikingly bold yet simplified frame with a singular, angled 2” down tube, which makes dismounting your ride a little easier in stop-and-go traffic. Not to mention, it might turn a few heads. Chicago streets can be tricky terrain to navigate. We gave the BLACKLINE balloon tires that smooth out your ride, won’t slow you down, and lessen the worry of roadside repairs during pothole season. A gallery of images featuring the finished prototype of the BLACKLINE. It was a long road to competition. Below are some images of the various steps from start to finish. The Bike Design Project is a pioneering bike design/build competition partnering high-level design firms with American bicycle craftsmen to create the Ultimate Urban Utility Bike - the next wave bicycle for the everyday rider. One team from Chicago, New York City, Portland, San Francisco, and Seattle - all working from the same design brief - will each develop their idea of the new urban bike. From July 28-August 2 choose your favorite bike by voting online. 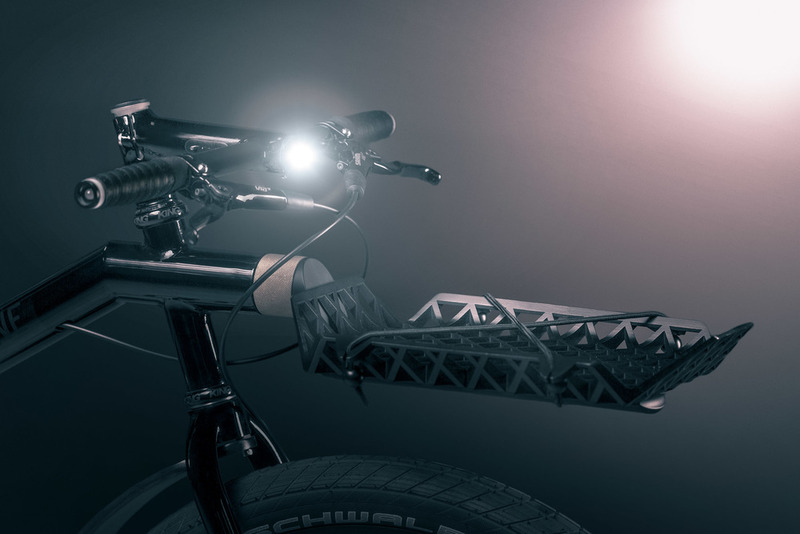 The bike design with the most votes will be deemed the Ultimate Urban Utility Bike. In a unique partnership with Fuji Bikes, the winning bike will go into mass production, debuting on the retail floors of national Fuji dealers in 2015. For the first time ever, a highly considered, collaboratively produced urban bike will be available to consumers. MINIMAL is a Chicago-based studio creating iconic, disruptive, brand-building products and experiences that connect emotionally with users. We are a collective of top cross-disciplinary design risk-takers and doers infused with entrepreneurial drive. Disrupting the norm, creating meaningful change and delighting the user are our passions. This is embedded in our DNA and our unique hybrid business model that combines consulting with global brands, venture partnerships and our own self-incubated in-house brands. From brand-defining icons and game-changing new product eco-systems for companies like Xbox, Microsoft, Google, Dell, Coalesse and Apple, to exploring uncharted territory on riskier ventures with start-ups and entrepreneurs, our award-winning work spans a diverse range of industries from technology, medical and consumer products to lifestyle, furniture and environments. As a pioneer and amplifier of the crowd-funding movement, MINIMAL is vested in the evolution of this emerging paradigm through ambitious projects and partnerships. MINIMAL is led by Smithsonian National Design Award winner and former Nike Global Creative Director Scott Wilson. Garry Alderman, Founder of Method Bicycle: I was educated as an architect and a craftsman, and have always been making things, and continually in pursuit of dedicating my life to a craft that could give me the right outlet. I have found the bicycle is perfect for combining the designed object and the act of making, with a unique emotional connection to the world around us like nothing else. There is something elegant about the simplicity of the machine that is a bicycle, yet there seems to be a lifetime of work in it, which is what really excites me. I am not interested in sitting behind a desk. Instead, my fulfillment comes from holding a torch or a file in hand and running a one-person shop. I plan to keep it that way for some time, as I feel it allows me to have a greater connection to what I’m doing. Things take more time that way, but for me it’s about doing things with intent, quality and pride. I am not concerned with how many frames come out of my shop; rather it’s about intensely focusing on everything I do – my job is never finished. Each frame is built one at a time, with a unique combination of material, process and experience in each build. Fellow Kickstarter alumnus, Helios, worked in cooperation with MINIMAL to customize a new handlebar, build new electronics, and give our cockpit some serious tech. 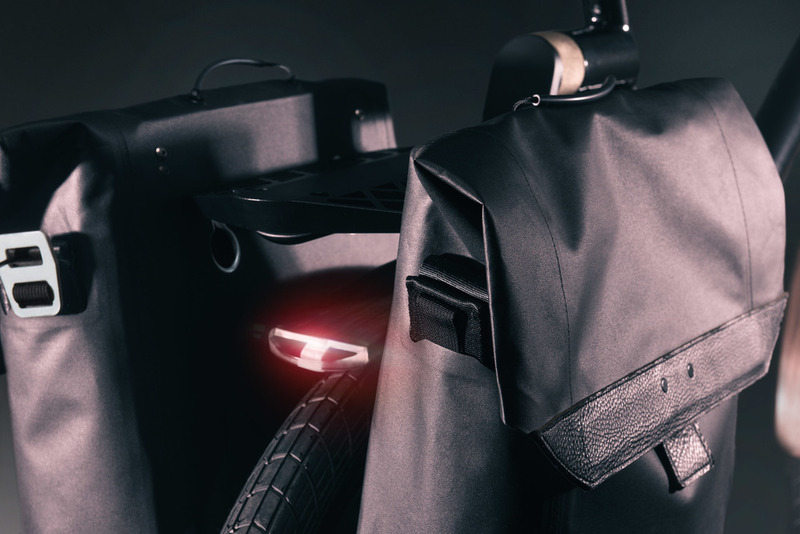 The bike may turn heads, but their tech keeps riders visible and safe on every journey. MINIMAL worked with SRAM to customize their internal 3-gear hub that was developed for the World Bicycle Relief program. In addition to the hub, SRAM also provided hydraulic disk brakes, brake levers, and the crank for our bike. Thanks to SRAM for keeping it local in the CHI. MINIMAL turned to the technical expertise of the soft goods designers at Terradzign for advice on how to build killer panniers. They knocked it our of the park. We couldn't have realized our design without their help. Filmmaker, consultant, friend, and all around smart guy Paul Detjen was central to the success of our video. Thanks Paul for helping us tell our story and for all your hard work. We are in your debt. Model Solution helped bring the multi-configurable rack system to life with a few expertly machined parts. We couldn't ask for a better partner for prototypes that are as fast as they are accurate. Joe may live in Portland, but his Chicago roots run deep. Joe nailed the script for our video, and gave us the inspiration we needed to bring the BLACKLINE to life. MINIMAL is an award-winning 360° product design and brand incubation firm creating iconic, disruptive, brand-building products and experiences that connect emotionally with people. © 2014. Property of MINIMAL, Inc. All rights reserved.